Or, how to be like Nike and JUST DO IT and get your content marketing plans unstuck by using a simple, sticky note-based planning system with 6 (well, nearly) steps. There are plenty of reasons you may currently be stuck or stymied in planning your library, info center or info pro-based content for marketing. In this separate post and video I talked about WHY your planning may be stuck, you, what you may be hiding behind, and how important it is to get unstuck. But you can skip the Why, the What Ifs, the “I’m not sure” and just jump right in like Nike wants us to … and JUST DO IT! A wise coach has told me (I’m still working on ingraining it!) 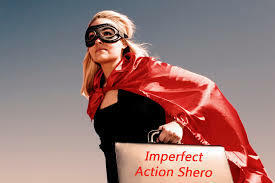 that “imperfect action is better than perfect inaction”. So the best marketing plan is the plan that gets done and gets implemented – now. And then tweaked later on. That’s always better than no plan and also better than flying by the seat of your pants. So to put it in action, I’m going to tell you the simplest, most low-tech, Just Do It kind of marketing and content planning. Sticky Note Marketing Planning. 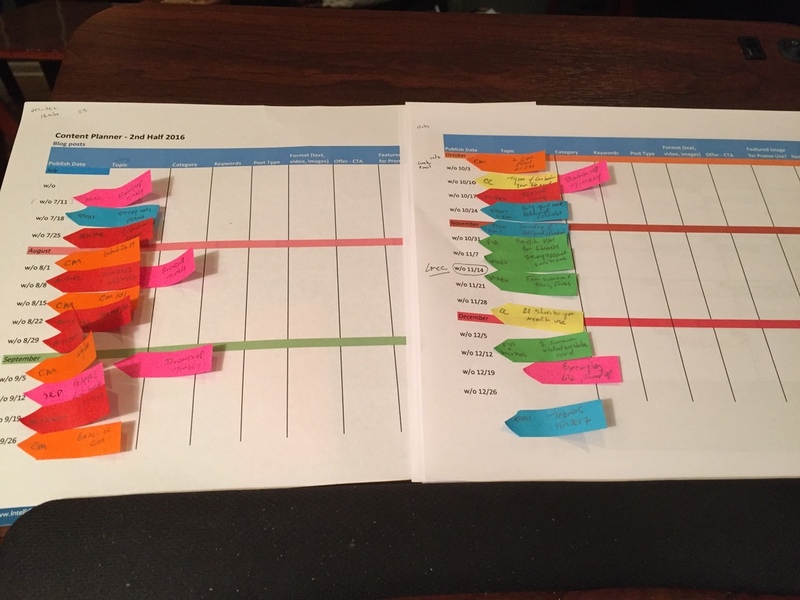 And I’ll show you – all my glorious, multi-color stickies and multi-color Excel charts from my own revised content planning I just completed. 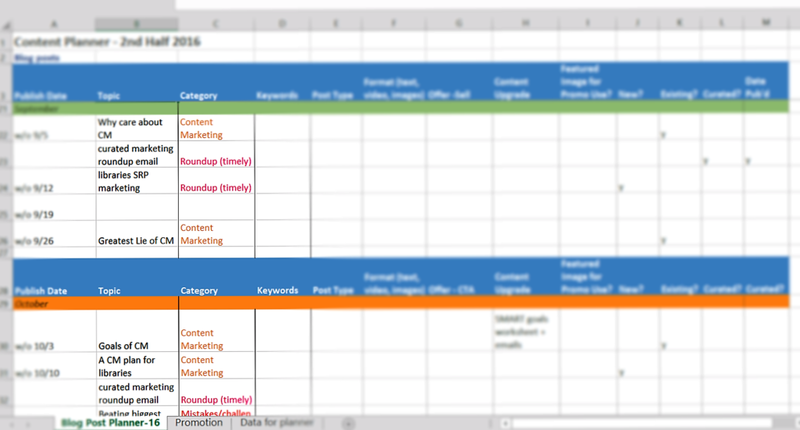 Ready to get your content planning unstuck and Just Do It? Go get your sticky notes! 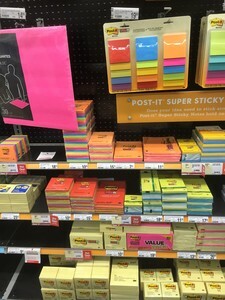 Raid the office supply cabinet, or your child’s backpack, or hit the back-to-school sales, and gather up highlighters and pens in lots of colors, Post-It notes in colors and sizes (small ones and arrows are really handy) and whatever other sticky planning tools you think you might need. Yes, multiple colors ARE necessary – to help color code your plans. Well, they’re certainly necessary for ME (I’m a very visual learner)! If you need to, use this as an excuse to hit the Post-It note aisle of your local office store – wow, there are lots of options – and find what suits your style and budget. Print out copies of your library’s calendar for the next 3 months. Or a Google calendar or your #CatsofInstagram calendar. Sure, it’s great if it already has holidays, library events, or even wacky dates on it as some online calendars do, but we are working old school so you still have to print each month. If you need to add holidays, important local events, wacky days, your own programs, key library land dates or potential tie-in events (e.g. Teen Tech Week, Star Wars Reads, Banned Books Week, the release date of the next likely-to-be-a-bestseller-and-hot-demand book, or a Harry Potter-related book whichever comes first), go gather up all those key dates now. Ok, got all those dates? Got your next 3 months laid out? Commandeer a long table or a big desk without too many piles of paper, or heck use the reference desk if no one is around. Now, lay out your 3 months of calendars and your sticky notes, and your marketing notes, and your list of upcoming community events and library events and university events and any other extra ‘research’ material or date info you need. You need to see your medium-range big picture as well as weeks and days, all at once. Hence, get room to spread, move, and unstick. 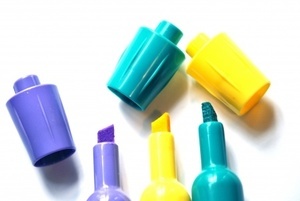 Important, do this before you uncap all those highlighters and markers. I don’t want you blaming me if you do this out of order and get ‘marker high’ and pass out. Start planning. Let’s JUST GO DO IT! Oh. That was too vague, wasn’t it? Yeah, that’s where the “6 -ish or so” comes into the simple steps in planning. We need to expand this 5th step into WAY more detail than in the all the sticky note planning versions I was originally inspired by. Write down events that are set in stone, can’t-change-em, have-to-plan-for-them-or-around-them, in a bold color of marker right on your printed calendar. Figure out your own color coding scheme before you start this. E.g. I keep a Google calendar with additional calendars added on and color coded: Fun Dates to Know for connecting to trends or fun social media topics – is orange in the pictures above. I subscribe to a Nonprofit Writing Prompts calendar that is green. My own content posts are blue. If there’s a key event, program launch, or other promotion that is a MUST to plan around/for- it gets special treatment or a call out. 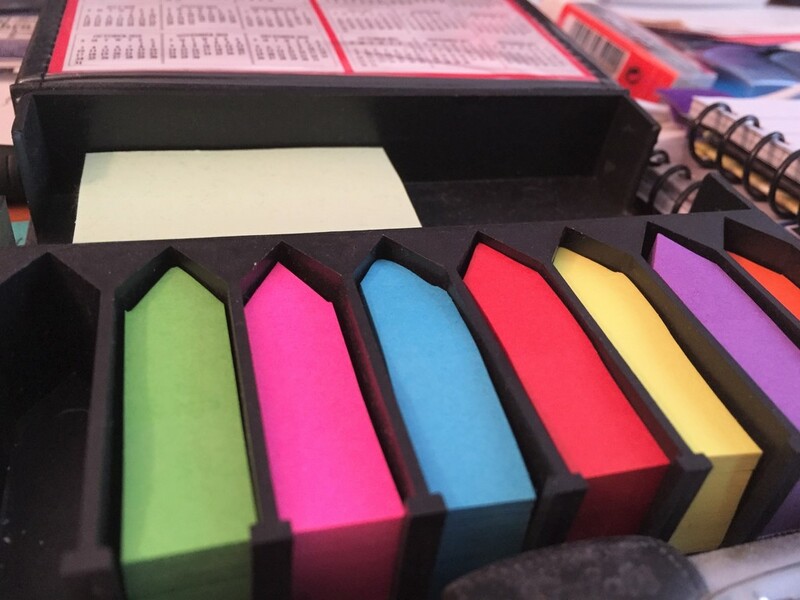 And I have colors of stickies for categories/topics of my blog posts … but that comes in a few steps. Idea download – take a few minutes to just brainstorm and write out your main topic areas, categories or themes on paper or even on larger sticky notes. E.g. in my revised content planning I knew there were some key areas of marketing I want to talk about for libraries. These have become my main blog categories. Things like strategy and planning, avoiding mistakes/pitfalls, content marketing, video for marketing, top tools to use, how to go about creating content for marketing, etc. 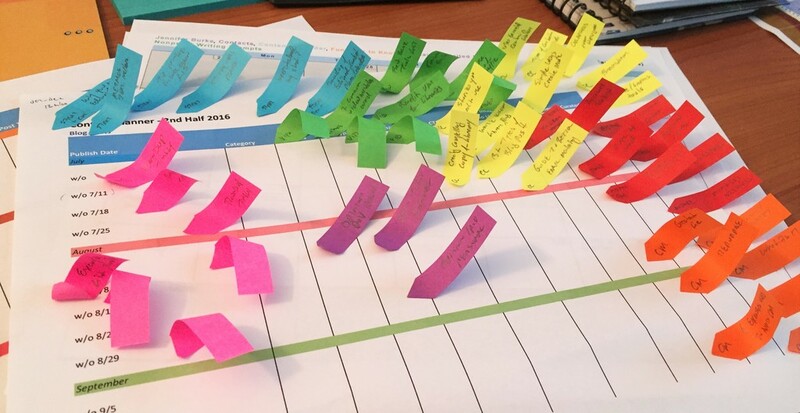 For this planning exercise for me, I was working on core topics for my blog here – so these colored sticky flags will each represent a post. I can then add in videos or emails that accompany those posts. If you do NOT have major themes or topic areas you know you need to cover in your library’s marketing, or already have been using … time to take a break. Team meeting time and library marketing plan review – what’s your focus, your goals and your big picture plan for the year? Maybe check out my SMARTer Marketing Goals post for a jumpstart or contact me for a FREE quick strategy starter session. Next brainstorming = post or individual tactical ideas. Let’s get more granular. 1 idea per sticky please! Write down any tactics, tools, approaches you want to consider for your events, programs or upcoming promotions. This can be under the categories or themes you have or a separate piece of paper. 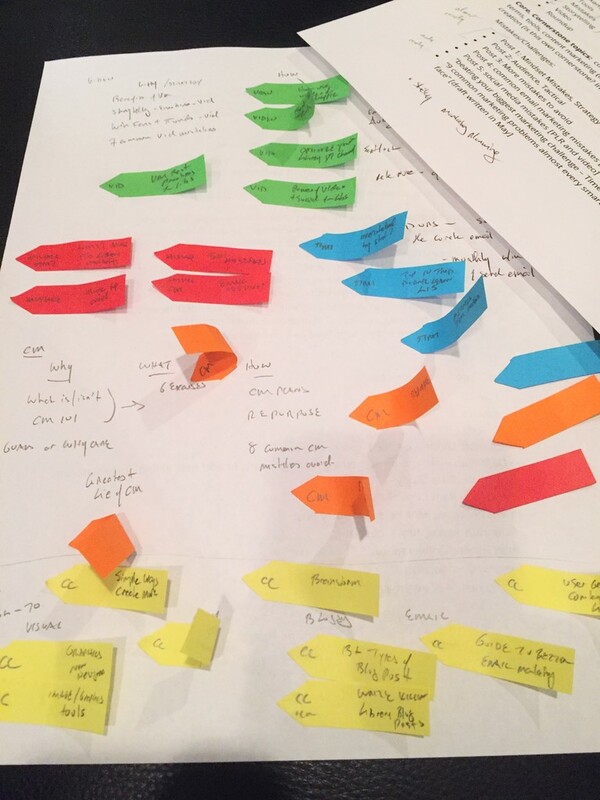 Maybe you know you need an email series ahead of each author event – give author events a color sticky flag and write names and ideas on single stickies. Have some ideas for blog posts in a particular theme or category? Write each idea down on a note for color of that theme (e.g. children’s book reviews = purple; adult programs = pink; teen books and programs = orange; etc). Have inspiration for a fabulous Instagram series? Write it down on a different color note. Or … stay with the color of that theme – i.e. weekly Instagram posts for picture books = purple w/ an I; or Instagram weekly series of Teen Makerspace creations = orange w/ I, and so on. 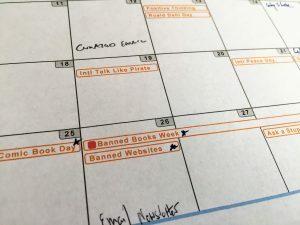 Doing multiple videos ahead of Banned Books Week? Message, key take-away of each video on its own sticky note. 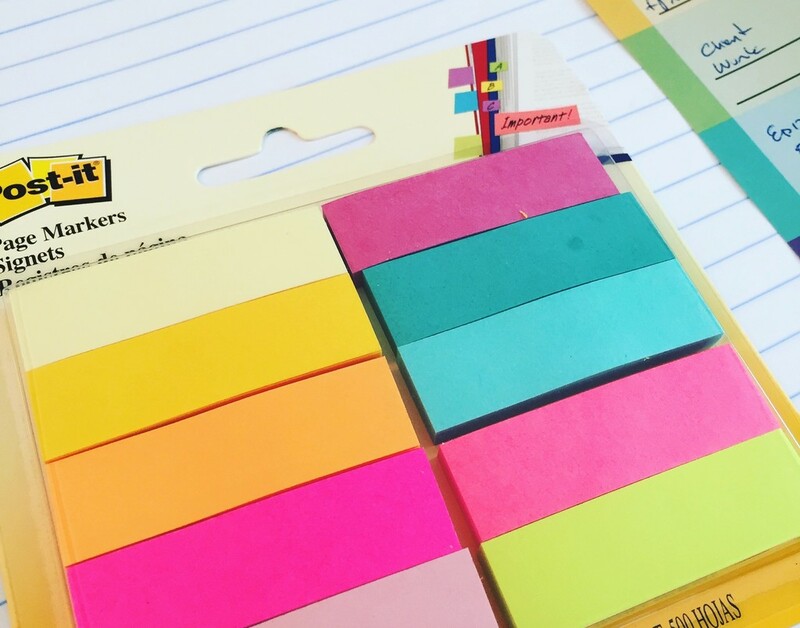 There’s no right/wrong way to start your sticky note brainstorming and organizing. Do what works for your library and team and helps you stay organized and see patterns. And because they are sticky notes, everything is replaceable, moveable, changeable; and they’re cheap so you can crumple them and start over if you need. For the events, promotions, programs or things that are still just ideas or don’t ‘fit’ just yet – put them with your category/topic/theme notes or in a kind of ‘holding zone’. Brainstorm and let the ideas flow along with what you see on your calendar, know about upcoming programs and promotional needs – accumulate sticky notes til you see patterns and efficiencies. More color coding – or shape/size coding: Consider designating a color of sticky arrow for types of promotional tactics or categories of content- e.g. green arrow is email campaign, light blue is promotional social media campaigns and the event itself is on a small sticky square. It’s good to separate the events/programs from the tactics and channels you use to promote each – because the channels/tactics can and will change. Now you can put the square (event/program) down on a particular date in the paper calendar and use the arrows to indicate when in advance you need to start your social campaign (each network gets their own color arrow even!) and when your email campaign starts, when flyers would go up, when to send a note to the local paper, etc. Or if you concentrating on the bigger content pieces in your planning – web pages, blog posts, a video series, then keep your sticky notes based on those big pieces and you can use your spreadsheet or other tools later to plan out sharing/promoting those content pieces. Do a little more organizing. Feel free to stick and unstick, move ideas and content pieces around. Look for patterns, themes, and more categories. Group things where it makes sense. E.g. in my revised content planning around blog posts, I knew I wanted multiple posts about video marketing and video creation, all done around the same time and all in advance or right after an event where I am presenting about video marketing for libraries. So I moved several key post ideas (green ones for video) to the weeks around the event – and saw how they fit, or didn’t, with what else I was talking about, my schedule, other library land events, etc. Sometimes, after all that careful planning, it’s a gut feel! You need to lay out the big pieces first. You need time to noodle around on when to start various promotional campaigns based on what worked or didn’t in the past, what’s going on in the library, the community, the world. You need to let the planning ideas sit for a few days as you stick and unstick, highlight, color code and start to see the picture come in to sharper focus. Give yourself time to have great new ideas as you drift off to sleep, or in the shower, or while driving in to work. You need time to bounce ideas off your co-workers, your team and even your boss. Do not give yourself so much time you need to print out a new month’s calendar and start over. Here’s the real beauty of Sticky Note Marketing Planning. You can unstick the notes. Yup, move things around. Re-stick ‘em. Move ‘em again. Maybe you don’t want to do email blasts for story time, but it would be great for the entrepreneur readiness series and sending emails to local small businesses and business leaders about new business books as they come in. Or a blog post idea fits better in July than June. Or one particular post or email should come before another, or after, because it really needs to be introduced and set up better. 6 month spread of weekly posts – each color a different category or theme. Initial plan – it can (and did) change. Because this method is cheap, easy, and flexible it is a prefect anecdote to those times you feel stuck or stymied. When ideas haven’t been flowing or your marketing feels disjointed and you need a reboot. Go ‘old school’ and break out the school/office supplies and do some rethinking and moving of the puzzle pieces. By turning off the digital tools and apps, by manually rearranging the pieces, we can often see more clearly and utilize different parts of our thinking set. Why did I say only print out and look at the next 3 months of your library’s life and marketing? Of course you have events and programs you have to plan MANY months in advance and that are already on the books. (oops, no pun intended). It’s because the 3 months facing you right now are the most ‘solid’ in your current agenda and the least likely to change. These are the immediate priorities that need attention. And they can also be the actions that leave us feeling blocked, stuck and anxious. It’s enough time to see all at one glance on your desk, to play around with, and to plan with a mix of both caution and ‘why not’ ease. It suits the Just Do It mentality we need sometimes get out of our own way. What about my long range planning – I can’t do everything ‘in the moment’?! If you can, go ahead and print out and highlight and sticky up the next 6-9 months, or longer. Or at least get those big projects written down in the appropriate colors, some notes written and stuck on as reminders. You can even go a bit wild and start sticking notes on those further out months while you’re in the flow! But be aware … things will change. Your marketing goals may need tweaking. Your metrics will say some things are working better than others. An event in the world will come up and you need to revisit your calendar and marketing plans. Priorities may shift closer to time and require you to tweak some ideas, rearrange others. To Do Lists. Doing It. Project management planning, task lists, weekly agendas and your ‘Just Get It Done’ lists. You planned in beautiful technicolor and stickiness. You stuck and restuck and now your marketing is definitely unstuck. Now take those plans and turn them into weekly and daily ACTIONS, so you really JUST DO IT. Maybe you move the sticky arrows to a printed weekly planner or paper calendar if that’s how you work. 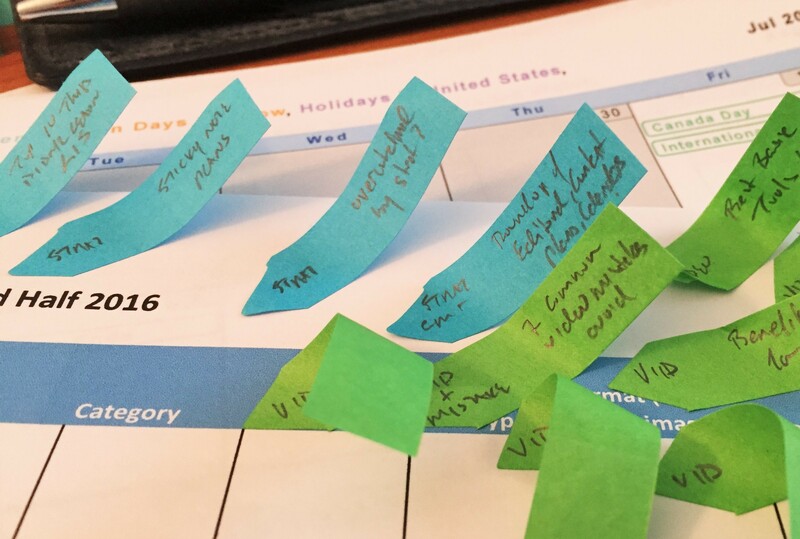 Maybe you ‘transcribe’ your sticky notes and highlighter bits into a color-coded group Google Calendar. Or into an Excel spreadsheet. Or a Google Sheet. Or Asana, or Basecamp,or a Trello board or even a giant physical whiteboard. The tech, tools and whatnot don’t matter. Use and do whatever works for you and your team. Just Do It and stick to it. What’s important is you take the big picture projects, promotions and plans and put them into small picture, chunkable tasks. When are you writing a given post or email? When will it be edited? Who is creating the featured images for the post/page – and in how many different social media sizes for sharing? When will they be ready? Don’t forget to set time to schedule those pictures + links in the social media management tool(s) you use. All of the ‘doing’ and executing are different checklists and action items – but they take the planning into doing and are absolutely necessary. 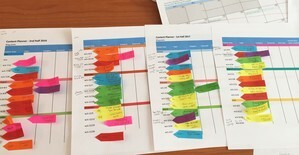 Check your tasks each week and every day, based on the overall colorful sticky plan you created. Look, I know it’s easy sometimes to say ‘do this’ and ‘plan that’ and that life doesn’t always go to plan. Literally. I also know from years of experience, lots of mentors and other marketing experts, and my own little voice that says ‘plan’, that it really is just that important for marketing, as well as overall business, organization and life goals. And I also know it’s hard. It’s hard to find time, it’s hard to do, it’s hard to stick to a schedule. I ALSO know that NOT planning is worse. ANY planning is better than none. Action is better than spending forever just planning. 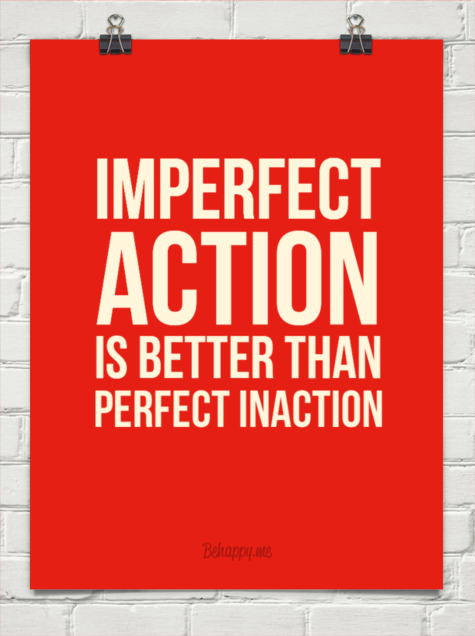 Remember the poster at the top – “Imperfect action is better than perfect inaction”. 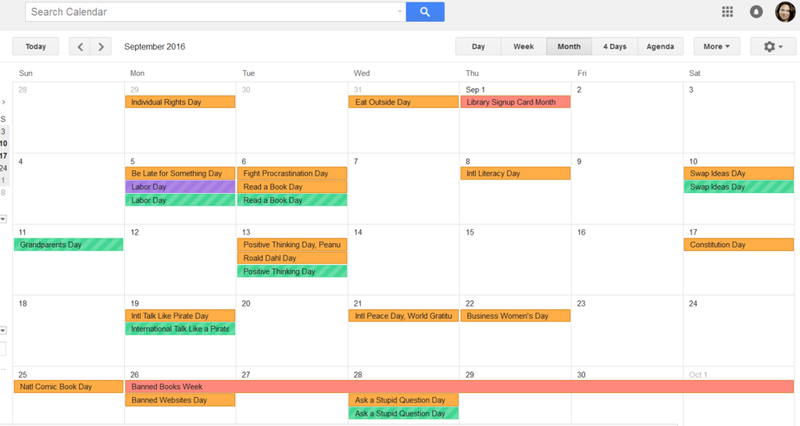 Slick Excel spreadsheets, organized Trello board or color-coded Google calendars are awesome. Sticky notes, arrows, colored markers, plain paper or paper calendars are also just as good if that’s what helps you and gets it done. It’s the process that matters. The brainstorming, laying the pieces out, seeing the plan visually, making changes and seeing the impact – that’s important. Get it all out of you head, your colleagues’ heads, your notebooks, your emails, your desks, and all your other calendars. It is never too late to start planning. Even if it’s the middle of the year. Or the middle of the week. Ok, the middle of the night is not so good. If you can find time this weekend, start. If you need to carve out time next Tuesday, great. Hey, put planning time in YOUR calendar. And then do it. Want to get notified when the videos that accompany this post are ready and as I create new ones? Of course you do! So sign up to get an email from me with the videos and more marketing planning tips. Of course, the good folks at CMI have a post on sticky note content marketing planning (it starts a bit long on theory and ‘why’ of brainstorming or planning and it’s geared towards serious marketing-only teams). I’m on Angela Wills’ email list and have met her in webinars and online classes. She teaches how to use the sticky note method for creating a business plan. I was so inspired by her emails and posts that I took the idea and ran with it. I’ve adapted it for doing and teaching marketing planning for my business, for organizations I work with and to show it can work as content planning for libraries too! There’s even a kit on Amazon for 7-column sticky note project planning – like this one I got as a give-away.